Top: VBS Mutual Bank logo. Bottom-left: President Cyril Ramaphosa. Bottom-right: DA leader Mmusi Maimane. 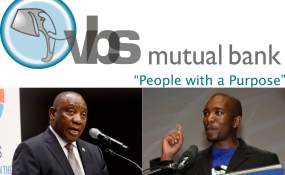 The ANC's top 6 will on Monday meet with officials from Limpopo after two of the province's top 5 were implicated in an explosive South African Reserve Bank (SARB) report into the collapse of VBS Mutual Bank. ANC Limpopo deputy chairperson Florence Radzilani and treasurer Danny Msiza are implicated in the report authored by advocate Terry Motau and law firm Werksmans Attorneys. In it, Msiza is labelled as a political influencer and fixer who got municipalities to invest in VBS. "Yes, the top 6 will meet the officials from Limpopo today to discuss the VBS matter," ANC national spokesperson Pule Mabe told News24 on Monday. He said the party's leaders wanted to hear their members' side on the saga. Mabe said although officials were meeting over the VBS report on Monday morning, he did not know if it would form part of discussions when the national working committee (NWC) met later. Fifty-three individuals - including Radzilani, Msiza and EFF deputy president Floyd Shivambu's younger brother, Brian Shivambu - have been implicated in the report. The younger Shivambu has instructed his lawyers to approach the courts to take the matter on review. Msiza has reportedly given the bank until end of business on Monday to apologise to him.